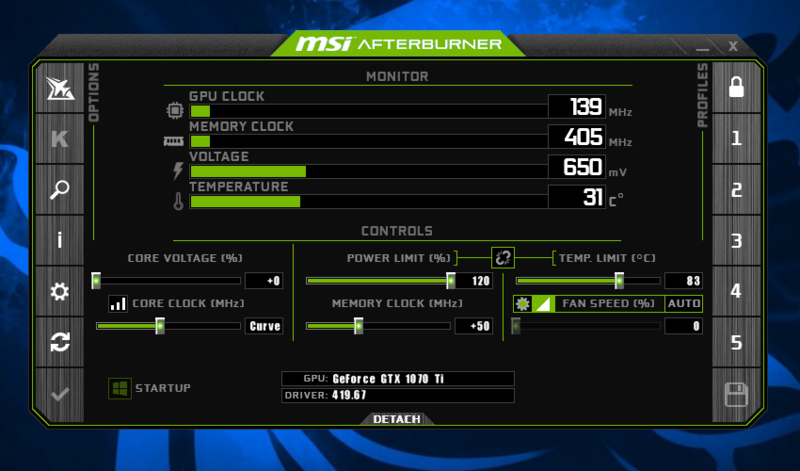 MSI Afterburner is ultimate graphics card utility, developed by the Guru3D RivaTuner team. The Beta releases sometimes have an expiration limit, the stable and final build releases do not. We recommend using a final build. We have written a GeForce GTX series 1000 and newer overclocking guide right here as over time a number of things changed like Curve based tweaking as well as automated tweaking. Not just that, we have also updated RTSS, our statistics server that enables the overlay with MSI AfterBurner to offer DirectX 12 overlay support. Please read the full release notes for all changes (as there are quite a few of them). Have fun tweaking. Does your overlay not work anymore after an update? Please perform a full uninstall of RTSS and AfterBurner (with profiles removal) and then perform a CLEAN install of it. Added new variables to “Separators” property gur node. Now you may define independent separators for the graphs located on top of text part, for the text part and for the graphs located on bottom of text part. Thank you for all the effort @Unwinder , that's a neat skin indeed. Would love to see more colour variations for it! "Also, we started implementing dual-fan control for reference design NVIDIA GeForce RTX 20x0 series graphics cards." Will we see support for custom brand cards as well in the future? Im so annoyed to use gpu tweak 2 to control my Strix 2080 OC's fans. Please take a note that only 100% NVIDIA reference design dual fan control implementations are supported, third-party proprietary asynchronous fan control solutions (e.g. EVGA iCX series asynchronous fans) are not supported and will not be supported in future versions. - Do the same for all images you want to convert to different color scheme. Thank you for this in-depth explanation. Will test it out later today. Cheers! It will be fixed in the next version of skin. 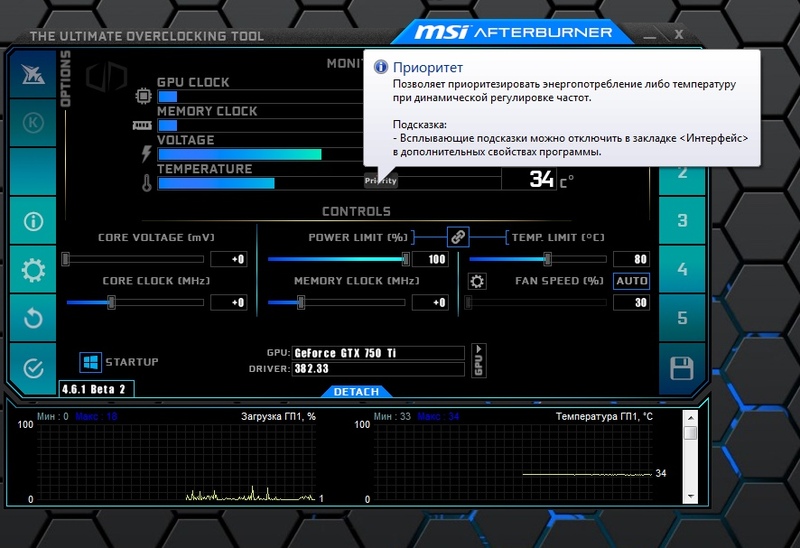 I have been used MSI Afterburner for years, but, untill now I don't know how to disable the "monitoring section" (below AB interface), definitely. When I click in the button "detach", the section is gone, but remais in the screen. The reason? Simple: I use Afterburner only to adjust the fan curve (I disable all monitoring tools). There is a way to disable this window? When I click in the button "detach", the section is gone, but stay in the screen. Hi Cruxys, I believe there is a way to do this as a work around but haven't tested it yet. Maybe Unwinder can add to this. Or native XOC skin from the second teaser video, which I posted in this thread. There were some teasers in AB forum section, demonstrating new 4.6.1 features in action. Hey, I couldn't find any info on this but is it possible to name the oc profiles? Like having the name show when you mouseover each button? Nope, there is no naming support, sorry. Nice... I will try this skin. Thanks! I love so much the native skin (and the new one, too). Awesome , thank you for the improvements and the hard work on your software @Unwinder , tested and i like the new curve and skin and is working flawlessly here on rtx 2080Ti , also working great on RX 580 as well. Great job Alexey ! Active 4.6.1 development is finished, so If there won't be serious problem reports related to _new_ functionality (I don't mean post like "everything is broken in new version, the previous one worked/overclocked better", which will traditionally appear soon) - we'll release final 4.6.1 in the next week or two.